Yesterday, Virgin Atlantic held a press event to reveal the Airbus A350’s interior. While the event was focused on the A350, during his speech Shai Weiss, the airline’s CEO, revealed the 747’s retirement plans. Following the delivery of Virgin’s A350 fleet, the Boeing 747’s currently operated by the carrier will be retired. This process will be complete by 2021. Virgin Atlantic has ordered 12 Airbus A350-1000s, with the first due to be delivered later this year. The aircraft will seat 335 passengers. Additionally, new, more diverse icons will adorn the nose of the aircraft. Virgin Atlantic currently operates a fleet of eight Boeing 747 aircraft. The fleet is entirely the -400 version of the 747. 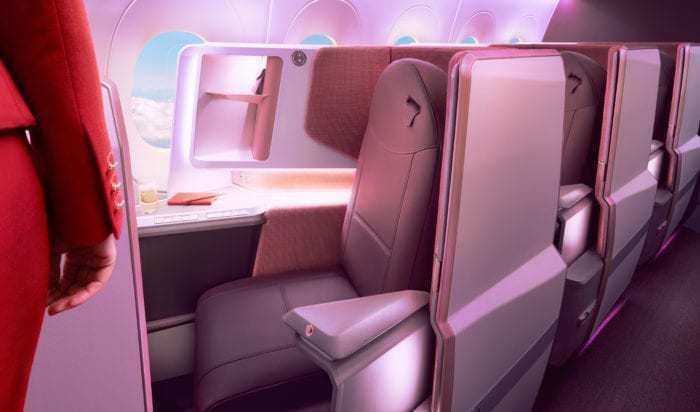 The aircraft seat 455 passengers, spread across 14 Upper Class seats in the nose of the aircraft, 66 Premium seats behind Upper class and at the front of the top deck, and 375 economy seats in the remainder of the aircraft. The oldest Boeing 747 still in use by Virgin Atlantic is 23 years old, while the youngest is 17 years old. The fleet has an average age of just under 19 years between them. Before the introduction of the Boeing 787-9, the Boeing 747 was Virgin Atlantic’s flagship aircraft. As such, the plane has been used for many special occasions. 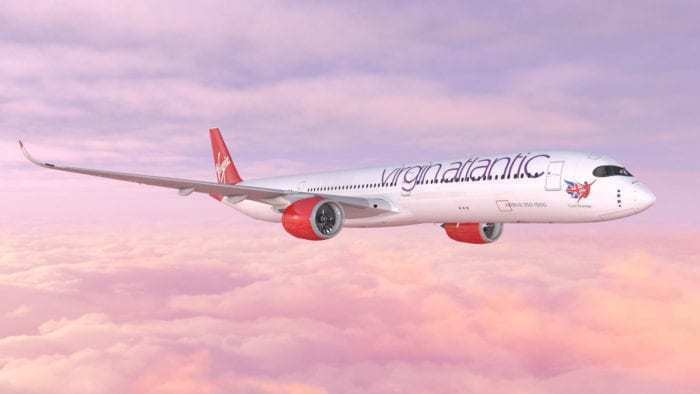 In fact, in October last year, Virgin pulled off an industry first when one of their Boeing 747s flew from Orlando to Gatwick using fuel made from recycled industrial carbon. Virgin Atlantic has ordered 12 new Airbus A350-1000 aircraft. The order, which was placed at the Farnborough Airshow in 2016, will be the airline’s first new type since the 787 was delivered four years ago. The first four Airbus A350-1000 aircraft destined for Virgin will be delivered this year. Coincidentally, British Airways’ first four Airbus A350-1000 aircraft will also be delivered throughout the remainder of this year. Virgin’s new Airbus A350s will be unique from the rest of the fleet in more ways than one. Firstly, the aircraft will be delivered with a brand new bespoke cabin. This will include a new bar area called The Loft, and brand new Upper Class seats, described by the airline as a suite. Additionally, the new aircraft will each uniquely feature the airline’s new icons which have been designed to celebrate the diversity of modern Britain. The first four of these icons will be delivered on aircraft this year, with the fifth and final icon being delivered in early 2020. 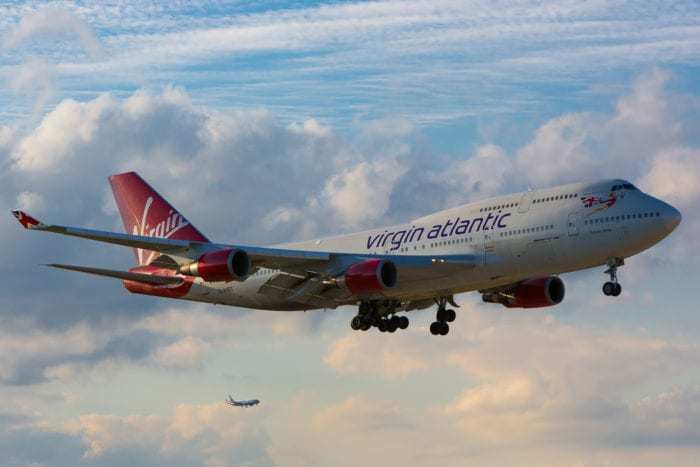 Will you miss the Virgin Atlantic Boeing 747? Is the Airbus A350 a good replacement? Let us know in the comments down below! I know that (some) people are very attached to certain older models of plane — such as the 747-400 — but it’s a good thing that older/noisier/less fuel-efficient planes are being retired a.s.a.p. In certain countries (e.g. The Netherlands), there’s a growing (left-wing) aversion to aviation, because it’s perceived to be bad for the environment, both in terms of emissions and noise. It has reached a point where further growth at Amsterdam and Eindhoven airports has been capped for purely environmental reasons, even though both airports could comfortably grow further in terms of flights per day. Today it’s NL, tomorrow it will be other countries. The only way around this — apart (where possible) from using larger aircraft per available slot — is by using aircraft models that have lower emissions and lower noise footprint. Landing fees at Amsterdam were recently modified so as to (further) penalize old/noisy/fuel-inefficient planes, and the Dutch government (and EU) are considering an environmental flight duty on plane tickets. If we want to keep flying — in certain countries, at least — we’re going to have to ditch the old birds and replace them by newer models. ” Is the Airbus A350 a good replacement? “Of course it is the best replacement because it will revitalize Virgin brand(for me Airbus is to Boeing what Apple is to Samsung,both are good but one has something else more than the other) and it is also perfect timing because of Boeing ‘s recent debacle.There couldn’t be a better replacement indeed.